Did The Vancouver Foreign Buyers Tax Work? A Year Later, The Debate Continues. Did the Foreign Buyers Tax Work? It’s been just over a year since the BC Government announced the 15% foreign buyers tax. A tax that was aimed to cool the market and squash speculative activity. So, did it work? The tax was designed to “cool” the market, not crash it. From January 2014 to January 2015, the average sales price of a Vancouver detached house increased by 42%. From January 2015 to January 2016 prices increased a further 43%. From January 2016 to January 2017 the average sales price dropped 20%. 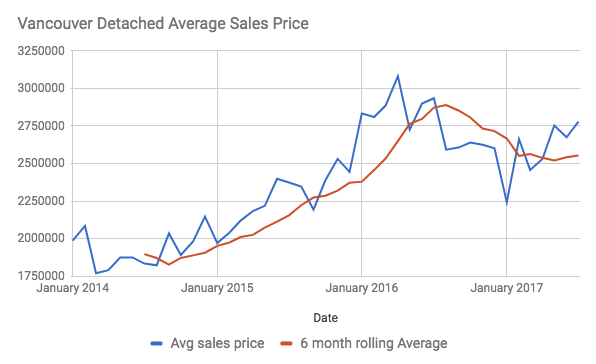 Six month rolling average for Vancouver Detached home prices peaked in August, 2016. Also note the 6 month moving average, which is on a clear trajectory downwards, peaked in August, 2016 the same month the tax was implemented. 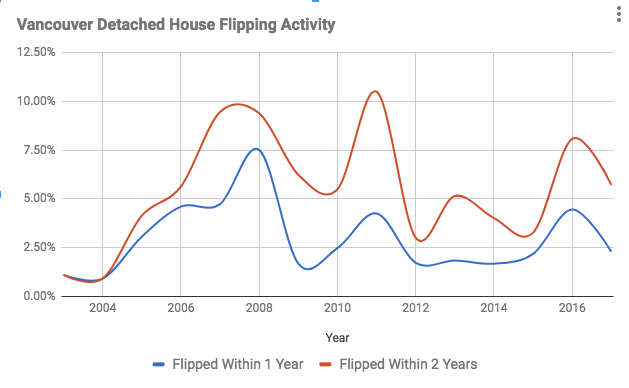 Further, detached house flipping has been nearly cut in half. In 2016, Vancouver detached houses being flipped within one year made up 4.46% of sales, and reached 8.1% over a two year window. It has since dropped to 2.29% and 5.7% respectively. Vancouver Detached House Flipping Slows in 2017. So we’ve since had an immediate halting of detached home prices and flipping activity. Yet condos continue to rise, so what gives? Despite many Vancouverites hoping for more affordable housing and or a price correction, the BC Government knows a price correction would wreck havoc on not just the BC economy, but the Canadian economy. Real estate fees alone make up almost 2% of Canada’s economy, that’s more than the agriculture, fishing, forestry and hunting industries combined. Not to mention Home equity lines of credit now make up 12% of Canadian GDP. Triple the United States back in 2007. And so, the BC Government is stuck walking a tight rope. Hence the introduction of a first time buyer loan program which was clearly targeted to keep demand levels elevated, and a foreign buyers tax which exempted the speculative pre sale condo market (Vancouver Condo Development Flooded with Assignments). One can’t help but feel this is all aimed towards engineering the miraculous soft landing that politicians dream of. So did the foreign buyers tax work? Maybe, maybe not. We may never know. How much of the detached slowdown was the market tiring itself, how much was from China’s capital controls? In a market so manipulated by bankers and politicians it’s hard to know with 100% certainty which policies are effective and which are not. Perhaps the question we should be asking is where would Vancouver Real Estate prices be without a foreign buyers tax?